The Rabbi with a Blog (Rabbi Jason Miller): Oh! The Plane's Gonna' Blow! Oh! The Plane's Gonna' Blow! This is a poem I wrote about the incident last week when a Jewish 17-year-old boy caused a U.S. Airways flight to be diverted because the flight attendant thought his tefillin (phylacteries) were a bomb. It's based on "Oh, the Places You Will Go!" by Dr. Seuss. Oh, the Plane's Gonna' Blow! On the plane you shall pray. You have tefillin on your head. You're travelin' with New York Jews. You can pray in any direction you choose. You're on your own. And you know what you know. If there's turbulence, the Amidah you will forgo. The flight attendant will see your odd boxes. Look'em over with care. Then she'll say, "Hey Kid, whatchya' got on over there." With your arm full of leather and your shuckling feet, you're too frum to take your seat. She'll tell the pilot the plane will go down. In that case, of course, you'll head to a new town. Since your tefillin looked so silly, you'll touchdown right in Philly. You'll say, "The box on my hair? You really need not fear!" Up there things can happen and frequently do, by people much more Middle Eastern than you. And when things start to happen, don't worry. Don't stew. Just go right along. They'll soon realize you're a Jew. You'll let out a sigh! You'll soon join Bubbie for soup in KY.
You'll be just fine because you'll have prayed. The feds will say "Oops, Sorry!" for the mistake that was made. Wherever you fly, you'll have learned quite the lesson. With tefillin no more will you be messin'. Fly El Al as a Jew. Please promise us that you will no longer fear. These Hang-ups can happen when you fly U.S. Air. You'll come down from the Lurch with an unpleasant phlum. And the chances are, then, that you will still be frum. Oh, the plane's gonna' blow! There is prayer to be done! You must say thanks to your Lord. You've done the right thing son. And the magical thing you do with a leather strap, will make you the most famous Jewish chap. No Shame! No one will think you're just a rube, the world will learn about tefillin on YouTube. They still won't get it. But you shouldn’t fret it. I'm afraid that some times you'll pray sans phylactery. On a plane, in a train, or by that Ol' Factory. Whether you like it or not, Alone will be something you'll do quite a lot. And when you're alone, there's a very good chance you'll meet people scared by your Jewish way. 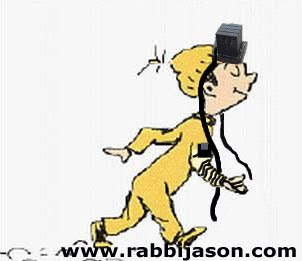 There are some, down the road between hither and yon, that won't know that a tefillin is what you lay. So… be your name Birnbaum or Schwartz or Levy or Mordecai Ale Van Allen O'Bevy, you're off to Great Places! Amidah = The central prayer in the Jewish liturgy, which is recited standing. Shuckling = Yiddish meaning "to shake." The ritual swaying of Jewish worshipers. Frum = Yiddish meaning "religious." Daven = Yiddish meaning "pray." Here is the video of me reading this poem. I tried to read the poem but since I am not a native speaker of this, It sounds really funny.